Increasing health awareness among people due to prevalence of chronic diseases and heart related disorders owing to improper diet and lifestyle is expected to be a major driving factor for the consumption of avocado oil. Advances in medical science and innovations in food nutrition have made it possible in producing essential oils that offer health benefits and are used in treating several health problems. Avocado oil is no exception. The growing popularity of this product has up surged its demand across various regions in the globe. Fact.MR analysis on the global market for avocado oil reveals that the global avocado oil market is expected to witness stellar growth in the coming years. To back it up, the research anticipates that the sale of avocado oil in various applications across the globe is expected to surpass an estimate of US$ 1700 Mn. Moreover, the global avocado oil market is projected to expand at a volume CAGR of 6.7% during the period of assessment, 2017-2026, which reflects that volume sales of the product across the global scenario. Manufacturers involved in the production of avocado oil are adopting various expansion strategies to increase their foothold in the market and by expanding their product lines. For example, Chosen Foods, a San Diego based company, has been acquired by Mexican company Sesajal S.A. de C.V. which claims to be a huge supplier of avocado oil. With this acquisition, the Mexican company can gain penetrating into foreign markets as products from Chosen Foods are largely sold across the United States and Canada, making it a beneficial target market for avocado oil in the coming years. 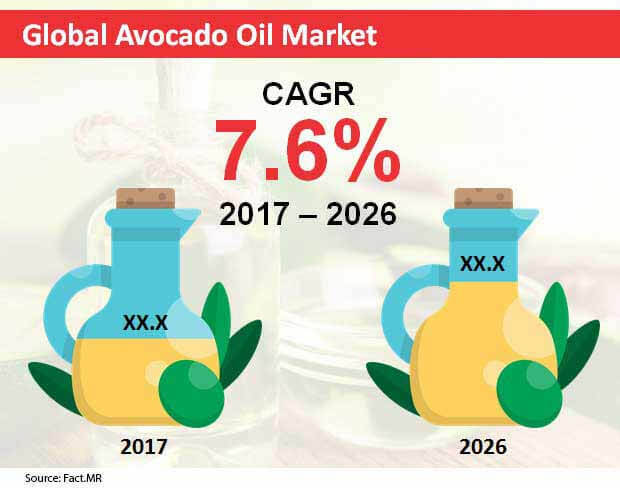 Key participants in the global avocado oil market include La Tourangelle Inc., The Village Press, Tron Hermanos S.A. De C.V., BIO Planète, Kevala International Llc., Avocado Global Pte Ltd., SESAJAL S.A. de C.V., CHOSEN FOODS LLC, Avocado Oil De Mexico, Bella Vado and Olivado Ltd.
Changing lifestyle and dietary habits of consumers across the globe are causing rising demand for easy-to-cook or ready-to-eat food products. As packaged and processed food products are convenient to carry, cook, preserve, and eat, consumers are preferring to purchase these products over fresh foods. Advanced technologies are being employed by the manufacturers to improve taste, color, flavor, and nutritional values of processed foods, which supports the industrial growth prospect. Increasing consumer demand for a variety of packaged foods and beverages are mainly contributing to the growth of the food industry. Avocado Oil being one of the main ingredients, high consumption of processed food products and beverages is expected to trigger the growth of the global avocado oil market in future. By source, hass is a highly preferred choice for the production of avocado oil. The hass segment is expected to grow at a high value CAGR of 8.1% during the period of assessment.